The canon of any historical category is never complete. Considering the possible topics that can be covered, and especially have not yet been so, is virtually limitless. In the case of World War II, this can be manifest particularly in terms of campaigns conducted during the course of the conflict. Author James P. Duffy has covered one of the more unfamiliar, neglected, and mostly forgotten campaigns: The nearly four year struggle to overcome Japanese resistance on the world’s second largest and, possibly, most geographically challenging and climatically inhospitable island of New Guinea. Indeed, it was one of the worst places on earth to wage war yet, given the priority the Japanese placed on it as a part of the southern border of their so-called Greater East Asia Co-Prosperity Sphere, it became necessary for the Allies to launch a campaign there in order to eliminate the possible threat of invasion to Australia and its supply and communication lines with the United States. Considering the overwhelming Japanese victory run in the early months of the war, such a campaign was largely problematic considering the lack of resources immediately available and the low priority placed on the Southwest Pacific Area (SWPA) of General Douglas MacArthur (following his evacuation from the Philippines) for said resources by the United States Department of War. As well, Australia was vulnerable and nearly defenseless also as many of its formations were fighting in the Middle East against the Germans and Italians, stationed in Burma, India, the Middle East or about to be gobbled up in the debacle of Singapore on the Malaysian peninsula. In spite of the lack of resources and the necessary training, particularly jungle training, of those American formations sent to Australia, the Allies managed to thwart Japan’s initial effort to capture Port Moresby on the southeast coast of New Guinea in the Battle of the Coral Sea in May 1942, the first battle ever in which opposing naval forces did not sight each other. The campaign necessitated more than three years as the Japanese continued to pour troops and supplies into New Guinea, stripped from other fronts; however, the eventual preponderance of Allied force (air, land and sea) and tactics was telling in spite of having to fight the Japanese as well as the elements and terrain. The victory won by MacArthur and his army only added to his reputation as one of America’s most successful military leaders and ably influenced his getting his way when it came to returning to the Philippines in October 1944, as he had promised following his evacuation. A previously published author, mostly on military history, Duffy researched many sources for this book, including official government histories, documents and publications, American as well as Australian, and multiple secondary sources. However, interestingly, there is a singular lack of citation of any Japanese sources in the notes and bibliography. The photographic section shows many of the personages mentioned in the text in addition to equipment employed, the troops in action, and the terrain and conditions encountered. The dozen maps included are helpful although some lack some resolution or have minimal detail. The only glaring mistake found in the text described B-25 medium bombers as having four engines, instead of the correct two. Jimmy Doolittle would never have gotten such an aircraft off the flight deck of the Hornet for the Raid on Tokyo. Also, the author describes Port Moresby as being on New Guinea’s southwest coast when it is located on the southeast. Otherwise, there is nothing to criticize here. 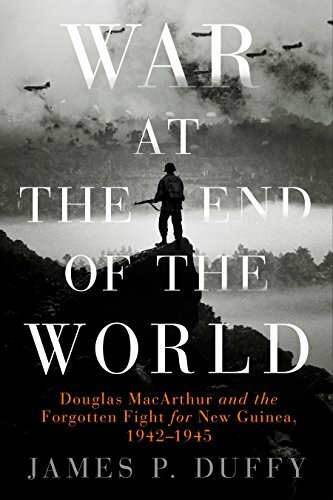 Although others have focused on individual battles or facets of this campaign, the author has produced an extremely readable overall look at what has been heretofore a mostly unfamiliar, neglected and forgotten phase of World War II. It redounds to his credit for doing so, if for no other reason than to make one question why so many wars are fought on such miserable terrain and under such horrific conditions.